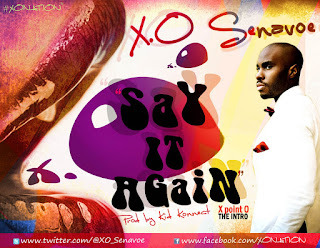 X.O SENAVOE UNVEILS BRAND NEW SINGLE - "SAY IT AGAIN"
Serving as the lead single to the forthcoming XPoint0 E.P from fast-rising Hip-Hop star X.O Senavoe, this “Say It Again” opus – filled with sublime live drums and grandiose synth patterns, produced by Kid Konnect – is exactly what fans and critics alike have been waiting for from Senavoe as he excellently highlights his immense lyrical prowess and captivates the listener with his catchy delivery and flow over the colossal sound. Taking the “when your chic blowing you kisses, she’s really saying my name”, line from one of his breakout tracks - 2010’s “Victory”, transforming it into the hook of the brand new “Say It Again” and surrounding that hook with three heavy-laden verses of quotable after quotable after quotable, X.O Senavoe shows us exactly why he is considered as a tour de force among African Hip-Hop spheres and with the XPoint0 E.P firmly on the way, Senavoe is poised to turn the whole game on its head. X.O Senavoe - one of the most exciting breakout artists to grace the public's attention - has rapidly risen from an enigma, a name whispered among industry insiders, to an artist widely sought after by artists for collaborations and music consumers alike. His confident and consistently laudable delivery captures the ears of his audience instantly, while his superior lyrical dexterity captures their minds with the imagery he projects in his words. Of Ghanaian and Nigerian heritage, X.O Senavoe - who took part in the first ever BET Nigerian Cypher earlier this year - has rapidly become one of the most talked about African artists and revered rappers in 2011 and is currently on the verge of putting out his highly anticipated free project XPoint0 to be followed shortly by his debut album It’s Possible.